Radiators rust internally producing black iron oxide 'sludge'. This sludge moves around the central heating system, blocking pipes, valves and boilers (pumps/heat exchangers/diverter valves). For minimal disturbance normally set up outside your home, with our equipment. Our engineer will attach a powerful magnet filter to the pipe work system by removing the circulatory pump or a radiator (no other radiators are disconnected from the system). When powerflushing begins the rust debris comes out from the central heating system & radiators and is completely filtered by the magnet. The filtered system water then continues into our Powerflush machine where we add cleaning chemicals which start to loosen the rust. As hot water flows through the system we can use an infrared thermometer to check for cold spots which show where rust deposits are. Any cold spots found on radiator surfaces are then vibrated (which rapidly loosens sludge, rust debris) until a uniform surface temperature is recorded all over the radiator. Once this is achieved the radiator valves are turned off so that the hot cleaning chemical can soak surface rust while the next radiator is worked on. 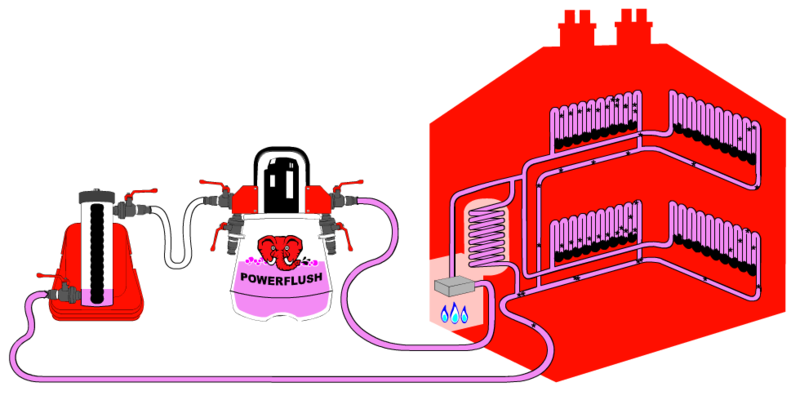 Once all radiators, hot water coils and feed tanks etc have been checked and cleaned we then fill our Power flush machine with clean water and purge the radiators one by one. Whilst clean water is flowing through the 1st radiator pushing all the loosened surface sludge, rust debris and chemicals out we vibrate the radiator to ensure as much debris is removed as possible. TDS (cleanliness) and pH readings are taken for the water from each radiator until acceptable target readings are reached. Once all radiators are clean we add a small amount of alkali neutraliser and a DWTA approved Rust Inhibitor. The central heating system is then reinstated and balanced as required so that all radiators work to optimum performance. Finally we issue you with your Powerflush certificate which you may need for any warranty cover secondary work that you seek.